The Houston Children's Chorus and the children of Galveston will present their annual Summer Pops Concert. The concert is the culmination of a one-week residency and workshop for Galveston children, presented by the Houston Children’s Chorus. Galveston children in grades 3 through 7 are selected from area schools. Houston children pay their way to spend the week in Galveston to work alongside the Galveston children. Stevie Rivers Rawlings, a nationally-acclaimed choreographer from Verona, N.J., is the clinician and choreographer for the week. 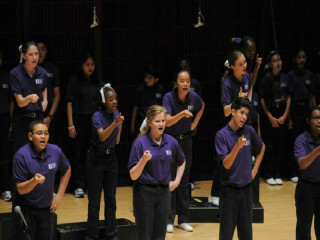 Stephen Roddy, Founder & Director of the Houston Children’s Chorus, is the choral clinician and conductor.